Each year, 350 construction professionals gather at the prestigious award ceremony to celebrate the good, the great and the simply outstanding. 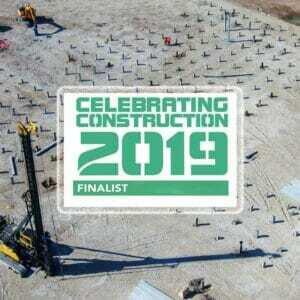 With over 100 outstanding submissions received annually, the East Midlands Celebrating Construction Awards judges have an onerous job of selecting the winners. 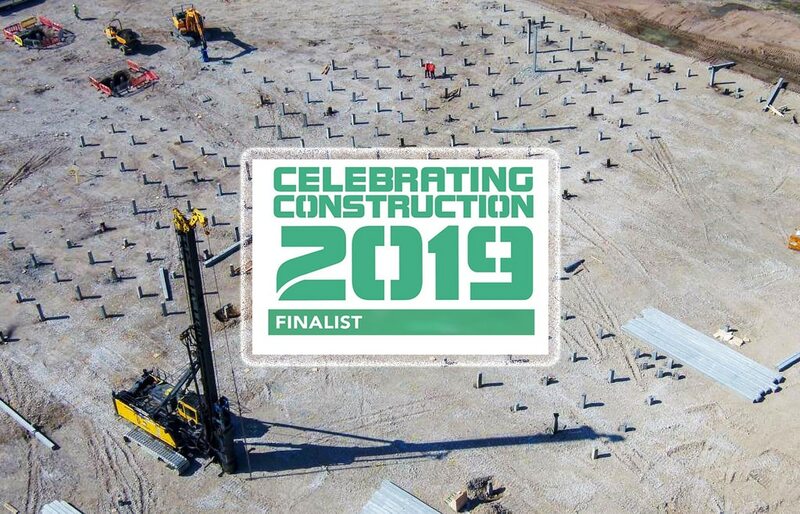 Aarsleff Ground Engineering Ltd are delighted to have impressed the judges to become finalists in three categories in the ‘Celebrating Construction 2019 East Midlands’ Awards. We have been shortlisted in the following: ‘People Development Award’, ‘Project of the Year Civil Engineering’ and ‘SME of the Year’. Aarsleff Ground Engineering are also proud to be sponsoring the ‘Health and Safety’ Award, with our Managing Director Kevin Hague handing over the trophy to the deserving winner on the evening of the awards. Aarsleff Ground Engineering are a truly multi-disciplined business now, opening up internal communication channels sufficiently enough to be able to offer their clients a one-stop-shop ground engineering package solution on site. Aarsleff are also focusing on design and moving into a more digital age, which comes with their decision to invest heavily in Virtual Reality. Our Senior Leadership Team have a clear vision in how to develop and enhance best practise by fostering an open and collaborative working environment. They have implemented regular forums, otherwise known as ‘Staff Chats’, where everyone in the business gathers together and discusses the status of the business completely transparently. They also circulate a weekly report to all, detailing every single KPI across all departments of the business. Unlike other businesses, their company data is not siloed, but instead shared across all areas of the business every single day, allowing all staff to seek out opportunities, identify trends, and recognise how each department’s performance aligns to their overall organisational goals and objectives. A monthly newsletter also positively engages the workforce and formerly recognises individuals for outstanding performance. Everyone in the business is encouraged to send in photos or projects or things of interest for the company’s social media profile. Both activities have been successful in bringing the company together as one. Finding ways to visualise our services can be challenging – everything we do is underground – yet our new Virtual Reality application will make it possible for everyone to engage with our ground engineering techniques in a more detailed, dynamic and accessible way than ever before. Aarsleff endeavour always to be at the forefront of the industry by delivering the best solution with excellence in quality at our core. Being shortlisted for ‘SME of the Year’ would not only highlight business excellence and quality of product to Aarsleff’s clients, but would be a huge achievement for the whole team at Aarsleff Ground Engineering. In October of last year, Aarsleff Ground Engineering were awarded the design and build ground engineering contract for a new 200,000sq ft Rochdale Riverside retail and leisure. Aarsleff helped the main contractor change the piling method undertaken for the project, which helped accelerate the programme quicker than anticipated. When the team encountered an onsite program due to unforeseen obstructions, Aarsleff proposed a piling solution that helped to overcome the issue in a quick and cost-effective manner. Completing a number of different ground engineering services for the client, Aarsleff worked collaboratively with the contractor, sharing resources to improve efficiency. Aarsleff installed a 152 lin/m King Post Wall, providing the level ground for a new access road situated behind the wall. For the cinema, we engineered a solution to allow piling to take place adjacent to a live metro station whilst keeping it cost effective for the client, resulting in a combination of 43 No. CFA piles and 16 No. anchor piles to 17m depth. For the rest of the site, we installed 302 No. precast concrete piles driven to 9m to 20m depth. As the area was brownfield, the sustainability benefits linked to our precast products were a huge driver. Our own manufacturing facility Centrum Pile produced the precast piles on this scheme, allowing the client a full audit trail and assurance of quality before installation. In the factory, waste is managed, rainwater is harvested, and innovation of the concrete processes has led to a vast reduction in cement use. Being precast, the products keep the surrounding ground intact so that there is no need to transport excavated material away which in turn minimised disruption to the local neighbourhood and reduces the level of vehicle emissions. Due to the site’s existing underground services, we amended the design and sequence of our works and proposed CFA piling as it eliminated vibration and disturbance to the nearby metro link. To advance the programme we utilised our parent company’s Junttan PM20HLC piling rig, sent over by Danish civil engineering firm Per Aarsleff A/S, a perfect example of a ‘One Company’ project. For our clients, using a single point of service for all foundation works saves time and money and ensures that projects can be managed effectively and safely on site. According to our client, “Communication is essential to any project, but Aarsleff Ground Engineering demonstrated real proactive engagement from the get-go, delivering first-rate customer care throughout the duration of the project”. Aarsleff Ground Engineering has created a culture that inspires and encourages the next generation of leaders. Recruiting employees with the necessary ‘key skills’ became increasingly difficult for the company, so we took the decision in 2015 to establish our own Graduate programme and develop the talent we need to take the company forward. Allowing our graduates exposure to all areas of the business (accounts, commercial, operations, plant, estimating) provides each individual with a good knowledge base in how Aarsleff and geotechnical businesses in general work. Two of our graduates who came through the first set of programmes are now Senior Contracts Engineers and permanent members of the Aarsleff team. With the uncertain UK economy, the construction industry needs many talented people at all levels as well as a flow of new people to ensure it doesn’t falter. Aarsleff Ground Engineering are keen to bridge the generational gap at work and encourage greater mentoring between young people and their leaders through our own development program titled ‘Young Talent’. In 2016 when it was first launched, the Managing Director’s from our European sister companies nominated 3-4 hard-working staff members to represent at the annual event. The YT network motivates participants to evolve within the Aarsleff organisation, expand their development and travel Northern Europe all at the same time. Establishing our own Graduate scheme alongside other great initiatives like Young Talent, we hope is enough to inspire other companies to follow suit. ‘Young Talent’ members listentening to one of their leaders discussing ideas on how to ‘bridge the generational gap’.